Latest FlexTime Manager Release Provides New Scheduling Features! For Single Flex schools (those only running one flex period per day), FlexTime Manager now allows for scheduling multiple activities within the same flex period! The teacher interface will look different, as shown below. Scheduled activities will show as a tile instead of the full day ‘card’ view. If teachers need to schedule more than one activity during the flex session, they simply click on the green plus sign and select the activity. Teachers can schedule multiple activities during the same flex session. Students will still only be allowed to register for one activity per flex session. The teacher’s Student Attendance screen has also been updated accordingly. General scheduling functionality has been enhanced and bulk delete functionality has been added. Teachers can now schedule an activity for multiple dates and also make edits or delete in bulk as needed. 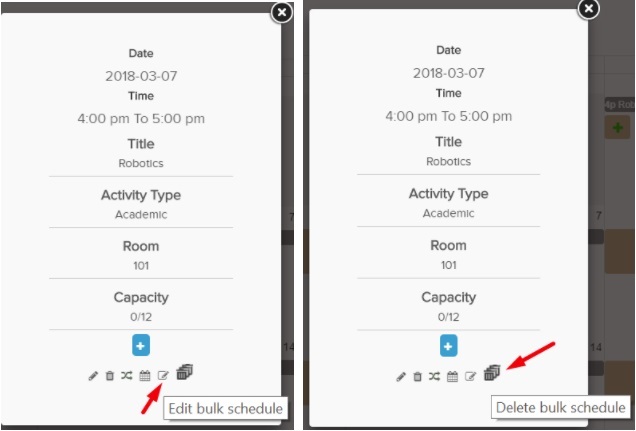 To make changes to the bulk scheduled activity or to delete any or all of the bulk scheduled activities, the teacher can open that activity from the calendar view and make edits or delete using the icons shown below. 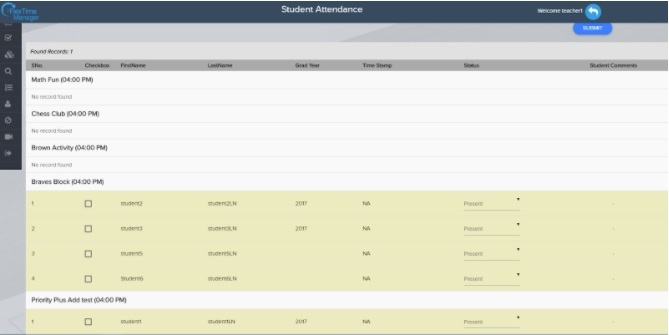 Edit Bulk Schedule provides the teacher with the original Bulk Scheduling screen in order to make changes. Delete Bulk Schedule provides the teacher with options to delete any or all of the bulk scheduled activities. The teacher must first enter Start/End Dates and Search for the Activity. Then the teacher can Select All or individual dates to be deleted. We hope that this enhanced scheduling functionality improves the user experience for all of our customers. Questions, concerns or suggestions? Contact us and an Eduspire Solutions representative will get back to you shortly.